Vancouver, BC – May 07, 2018 - Zinc One Resources Inc. (TSX-V: Z; OTC Markets: ZZOF; Frankfurt: RH33 – “Zinc One” or the “Company”) is pleased to announce additional drill results from the Mina Grande Sur zone at its Bongará Zinc Mine project located in north-central Peru. To date, 81 drill holes for 1,810.6 metres have been drilled (see map below in Figure 1. ), from which assays have been received for 24 holes. The table below summarizes results from nine holes that are located at the southern end of Mina Grande Sur. These holes focused on the delineation of mineralization to the south. Mineralization at Mina Grande Sur includes zinc oxides, carbonates and silicates hosted by soils, highly-weathered carbonates, and fine- to coarse-grained dolomites. Mina Grande Sur is one of three known zones of high-grade, near-surface zinc-oxide mineralization along a 1.4 kilometre mineralized trend that is being tested by this drill program. At Bongarita, which lies approximately 1.3 kilometres northwest of Mina Grande Sur, all results from the 36 holes drilled have been reported. A second drill rig recently completed drilling at Mina Chica, an area where a high-grade zinc deposit was discovered; it lies approximately 1.2 kilometres northwest of Mina Grande Sur. Results from 30 of 53 holes drilled, for a total of 2,370.9 metres, have been reported to date. The zinc mineralization at Bongará is hosted by carbonate rocks and is classified as a Mississippi Valley-type deposit. The mineralization is stratabound and is basically a tabular body with irregular boundaries. Hydrozincite, smithsonite, hemimorphite, and a zinc-aluminum-iron silicate are the primary zinc minerals that are hosted primarily by soils, heavily-weathered fractured dolomites and dolomite breccias. Given that the strike and dip of the mineralization is not known, the intercepts do not necessarily represent true thicknesses; moreover, long intercepts, e.g., MGS18-003, most likely drilled subparallel to the dip of the tabular mineralized body. At Bongarita specifically, mineralization is exclusively hosted by soils. Overall, the mineralization is focused along the axis of a doubly-plunging anticline as well as within the eastern flank of the anticline. Zinc One is focused on the exploration and development of prospective and advanced zinc projects in mining-friendly jurisdictions. 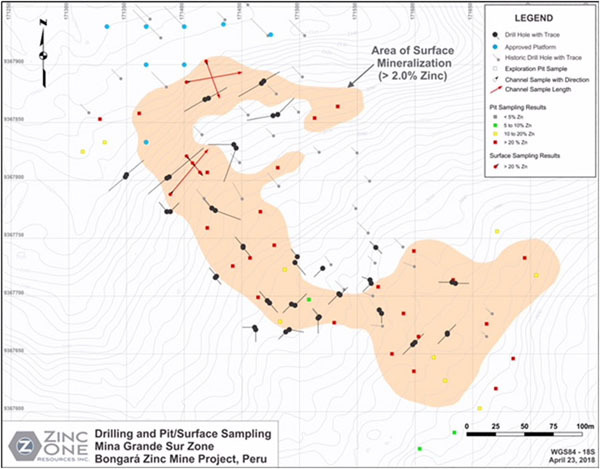 Zinc One’s key assets are the Bongará Zinc Mine Project and the Charlotte Bongará Zinc Project in north-central Peru. The Bongará Zinc Mine Project was in production from 2007 to 2008, but was closed due to the global financial crisis and concurrent decrease in the zinc price. Past production included >20% zinc grades and recoveries over 90% from surface and near-surface zinc-oxide mineralization. High-grade, zinc-oxide mineralization is known to outcrop between the mined area and the Charlotte Bongará Project, which is nearly six kilometres to the NNW and where past drilling intercepted various near-surface zones with high-grade zinc. Zinc One is managed by a proven team of geologists and engineers who have previously constructed and operated successful mining operations.